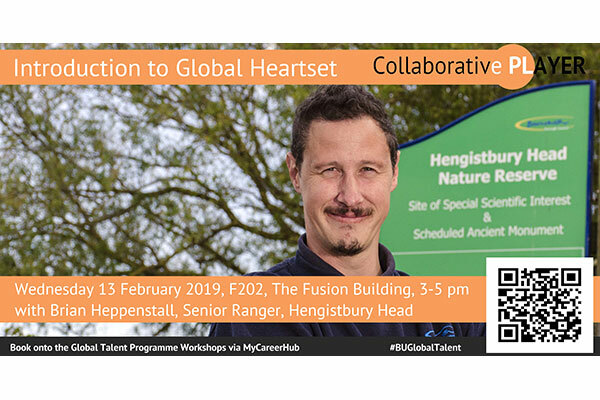 As part of the GTP core programme, this workshop will introduce Global Heartset as a key element of being a global talent, and focus on critical skills to connect with others and make a difference in the world. The workshop will be led by 2018 Alumni of the Year Award Winner Brian Heppenstall and BU students who are on placement at one of Dorset’s most scenic tourist attractions, Hengistbury Head. Senior Ranger for one of Dorset’s most scenic tourist attractions, BU Environmental Protection graduate Brian Heppenstall is passionate about looking after the environment and our wildlife, but also about educating and empowering others to do the same. Having benefited from a work placement himself, Brian is key advocate for work experience to enhance the academic degree and his significant work in this area has contributed to his 2018 BU Alumni of the Year Award. By sharing his story and the current state of the environment, Brian will highlight the ways in which nature is affecting our lives, our physical and mental health and how we can use nature to help. But also what we as individuals can do to achieve reciprocal benefits for everyone. Mollie Taylor (BU MSc Biodiversity Conservation) and Sijuade Yusuf, Bournemouth Borough Council "Leave Only Footprints" Marketing Placement (BU MA Media & Communication): Mollie and Sijuade will share their experiences of working on projects with a difference along with their BU studies. Emily Fergusson, Bournemouth Borough Council "Leave Only Footprints" Engagement Coordinator and Anna Skeates (BU BSc Ecology and Wildlife Conservation): Emily and Anna will facilitate a discussion on the controversial environmental issue of palm oil production and consumption. While open to other BU students, the workshop is designed and delivered specifically for the students participating in the Global Talent Programme. Attendance and reflection from the session allow students to gain core credit towards their Collaborative Player badge. Sign up to the Global Talent Programme today! Please note that photographs will be taken at the event. If you do not wish to be photographed, please email us at GlobalTalent@bournemouth.ac.uk.